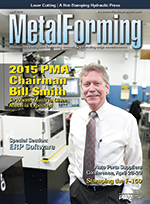 Reflecting on the value he's received from nearly 20 years as a member of the Precision Metalforming Association (PMA), 2015 PMA Chairman Bill Smith strongly believes that its now time to give back. And, he encourages his peers to do so as well. A specialist in mining-equipment rehab mines new markets thanks to an armada of Amada sheetmetal-fabricating equipmentthree press brakes, a CNC turret press and a 4000-W CO2 laser-processing cell with sheet tower and a rotary-index station for tube and pipe cutting. PMA's Automotive Parts Suppliers Conference, April 28-29 in Troy, MI, goes in-depth on what suppliers need to know about the current and future passenger- and commercial-vehicle sectors. While aluminum gets all of the press when it comes to Fords new F-150 pickup, there are many more firsts than meet the eye with this groundbreaking platform. Among them: a stamped 12-corner crush horn, a frame constructed of a startling 78-percent high-strength steel, and a cyclonic closed-loop aluminum scrap-segregation and recycling system. While companies have seemed willing enough to let the applications that surround and extend enterprise resource planning (ERP) reside in a Software as a Service (SaaS) environment, they were less willing to place their systems of record in a cloud that they did not specifically own or control. A 2014 study reveals a change in that thinking. For complex manufacturers to compete, they must revolutionize their IT-manufacturing strategy to put the customer, not production alone, at the center of their operations.